More savings for clients facing high taxes and low yields. For many clients and their advisors, taxes are a critical part of the wealth management equation. By reducing taxes, advisors can help clients enhance performance and keep more money compounding in their accounts to pursue long-term goals. Asset location is key to reducing taxes in a client’s portfolio and enhancing the tax efficiency of the client’s investments. For clients in high tax brackets and with high incomes, the savings and subsequent wealth created by asset location can be substantial. 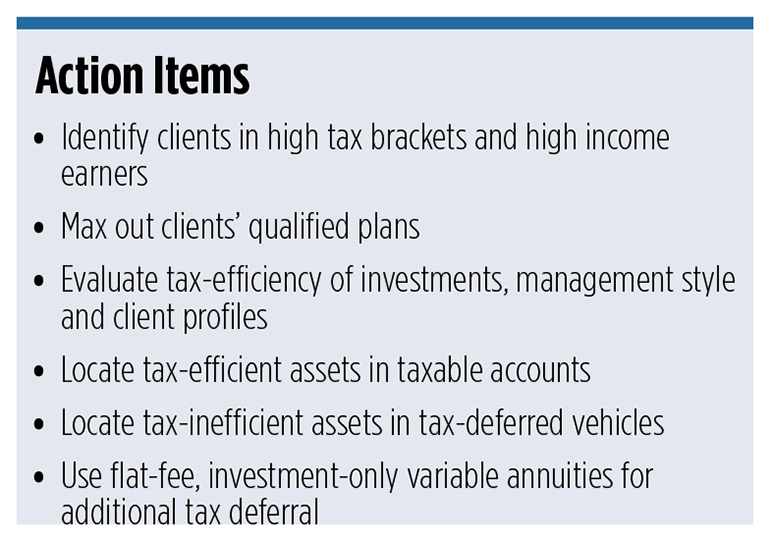 By locating certain assets in tax-advantaged investment vehicles, advisors can help clients dramatically reduce taxes over time and reliably enhance overall performance by 100 basis points or more. The tax efficiency of assets. Do they generate long-term capital gains, short-term capital gains or ordinary income? Examples of tax-efficient assets include buy and hold equities, index funds, ETFs, and tax-exempt municipal bonds. These assets typically would be located in a taxable account. Examples of tax-inefficient assets include actively-managed strategies, tactically-managed investments, fixed income investments, REITs, liquid alts and commodities. These assets would typically benefit from being located in tax-deferred vehicles. The management style of assets. Are the assets managed in a passive style or an active style? Actively managed strategies that involve active trading and higher levels of capital gains would benefit from location in a tax-deferred environment whereas passive strategies may work best in a taxable account. The client profile. This includes the client’s age, time horizon, tax bracket, level of taxable income, liquidity needs and estate planning needs. For tax-deferred location of assets, advisors will typically want to encourage the client to max out contributions to qualified plans such as 401(k)s, 403(b)s, IRAs and 529 Plans. But for high net worth clients in high tax brackets, it’s easy to quickly reach the allowable annual contribution amount but still need more tax deferral. These clients will need other solutions to achieve higher levels of tax deferral. Annuities may make sense as a valuable tool for tax-deferred asset location once qualified plans are maxed out. But many fee-based advisors balk at the idea of traditional variable annuities because they typically have high commissions, high M&E expenses and costly surrender charges. These expenses could cost investors 300 basis points or more — effectively wiping out the value of the tax deferral. To maximize the value of tax deferral, a variable annuity must be low cost. Fortunately, the industry has developed a new generation of investment-only variable annuities (IOVAs) designed as a low-cost tax-deferred investing solution. IOVAs typically have no commissions, flat-fees and no M&E charges. This helps to maximize the value of the tax deferral and enables clients to keep more of their money compounding in their accounts free of immediate taxes. Clients and prospects may already have traditional variable annuities in place with high annual expenses. If so, it may be prudent to review the benefits of transitioning these assets to a flat-fee, investment-only variable annuity. Advisors can compare the expenses (and benefits) of the two variable annuity options with clients and help determine which solution makes the most sense in a given situation. Typically, advisors will be able to easily demonstrate to clients the thousands of dollars in savings per year of a low-cost annuity. Then with a simple, tax-free 1035 exchange, advisors and their clients can transition the assets. Another key to helping clients best pursue their long-term goals is to make sure the investment-only variable annuity provides a broad range of underlying investment choices. Having an extensive lineup of underlying investments can provide more strategies for allocating assets inside the variable annuity. An IOVA with a robust level of investment options can help advisors truly manage the client’s assets, enhance diversification and maximize long-term investment performance. You can manage the underlying annuity assets with more control and more efficiency than ever before, implementing your own proprietary investment strategies and custom portfolio models. Morningstar estimates that investors who fail to manage for tax efficiency may be missing out on 100–200 bps in performance every year. One solution: asset location. Once clients have maxed out annual 401(k) and IRA contribution limits, you may be looking for other opportunities for tax-deferral. Flat-fee, investment-only variable annuities can provide tax-deferred location at a very low cost to clients.